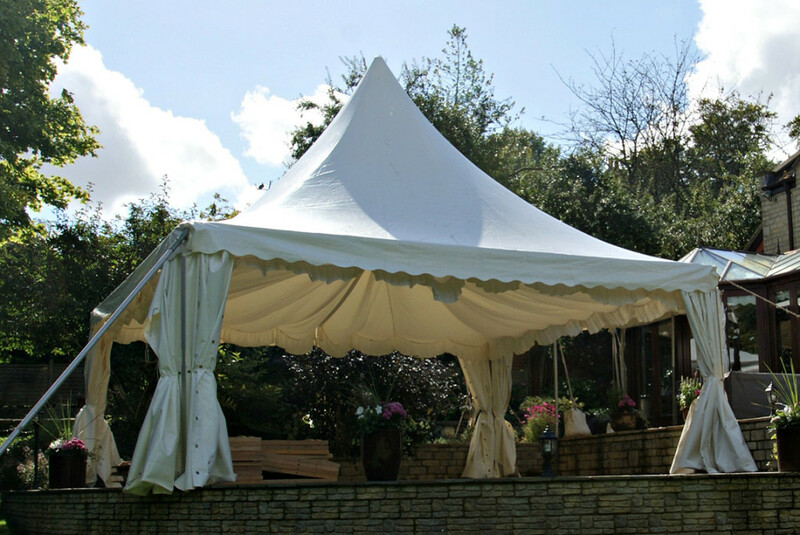 When it comes to planning the perfect, all-inclusive event, our Chinese Hat or Pagoda Marquees are a striking choice. Designed to add interest to the visual look of your celebration, they provide an additional option when it comes to shade and weather protection. 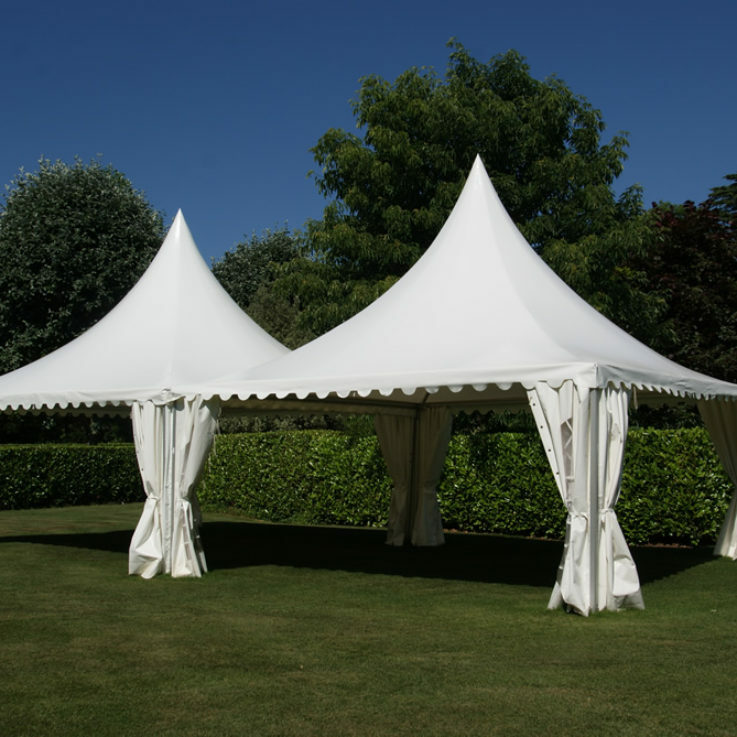 With their curved and pointed roofs, they help to create an elegant skyline that is entirely in keeping with the roofs of our Traditional and Clearspan Marquees. During outdoor sporting events, consider using these pointed Marquees to provide shade and a place for guests to relax with a glass of bubbles. Alternatively, drop the sides and create a haven of relaxation which can be dressed with our plush sofas and seating options. Many of our guests opt for these smaller coverings as a place to provide entertainment to small children or a calmer area for guests to escape the bustle of the party. 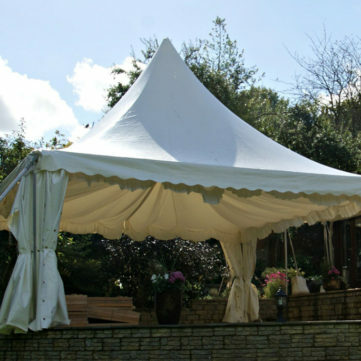 Here at Southwest Marquees, we provide our Chinese Hat or Pagoda Marquees in three sizes – 3m x 3m, 4.5m x 4.5m or 6m x 6m. 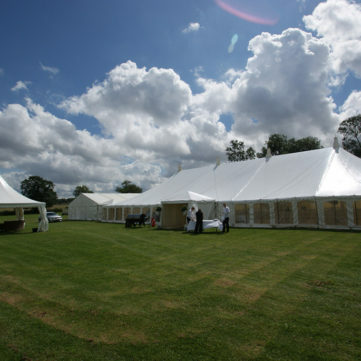 To create the customised event of your dreams, they can be linked together to create larger space or also integrated into the build of your Traditional or Clearspan marquee. From within, they feature a beautifully draped ceiling design – one that lends itself effortlessly to both traditional or modern-style weddings. As experts in our field, we have a team of experienced and friendly individuals who will help you to create the event of your dreams. 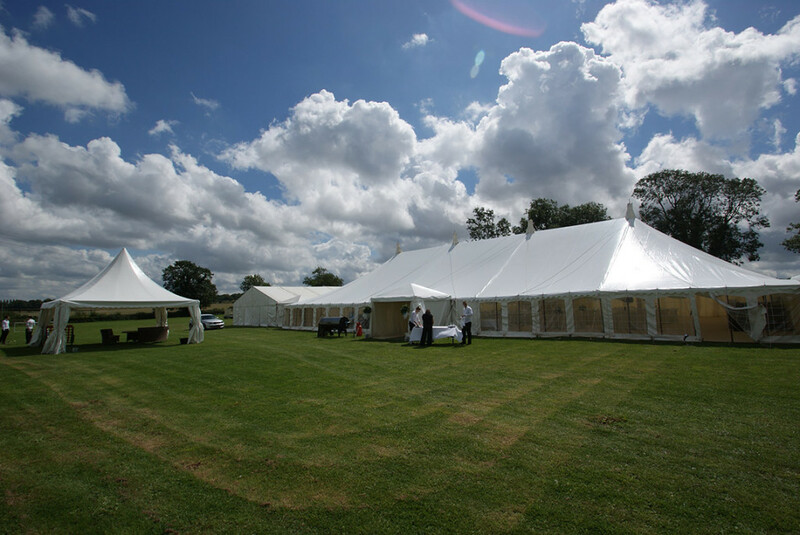 From weddings through to corporate meetings or sporting celebrations, our marquees are the perfect solution for your outdoor needs. 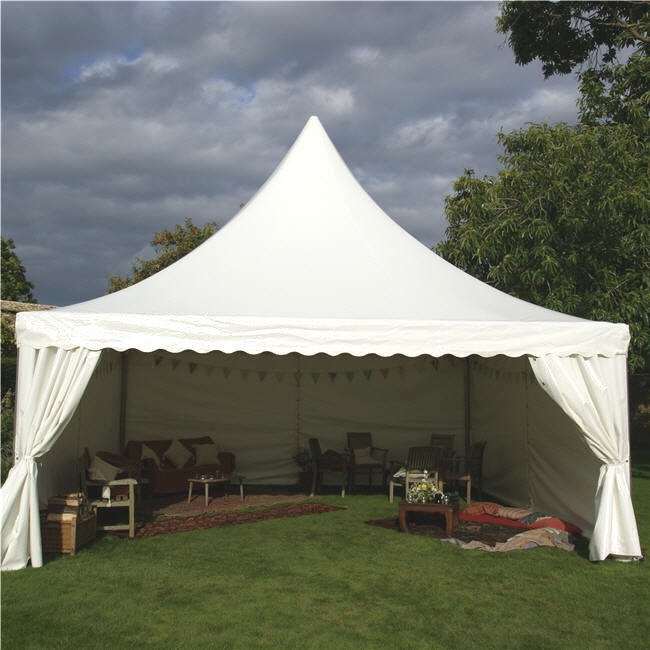 Our Pagoda and Chinese Hat marquees provide an elegant twist on the classic style while still offering you the comfortable dwelling spaces needed to ensure everyone enjoys themselves. Contact us today for more information or for a quotation. 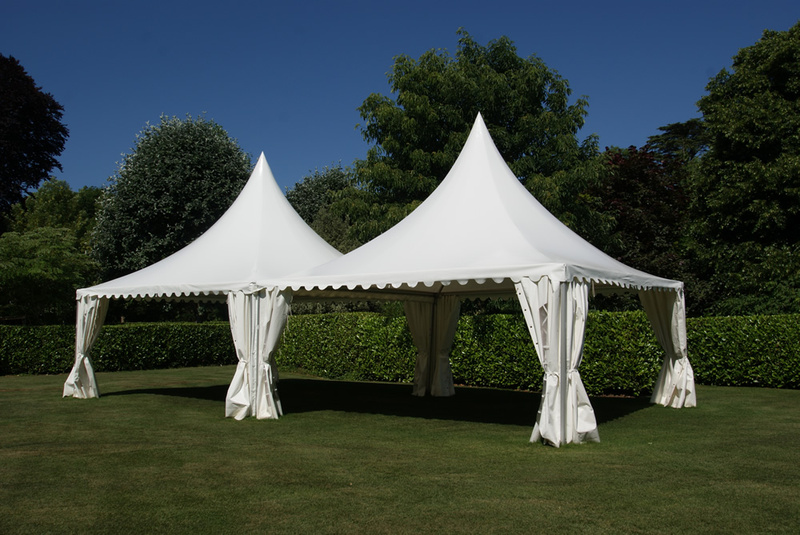 Many people use these attractive structures as a roof only marquee to provide shade and protection for reception drinks, others place them away from the main area as a quiet place to relax, or they can be joined to the central marquee as a comfortable chill out area. The way they mirror the roof line of a Traditional Marquee makes them ideal to use as an entrance porch. We really appreciated all that they did for us the days before our wedding! We would like to say a massive thank you to the team who came out to set up for our wedding, they were all so helpful and friendly – we really appreciated all that they did for us the days before our wedding! We had the perfect day and the marquee looked amazing! The lights looked fab in the barn and the kids absolutely loved the bell tent! Thanks to the guys for decorating the tent and trees with the extra lights we had, looked so nice at night! Such a lovely company, we are happy we got our marquee from you! can’t recommend you enough! We just wanted to say thank you for the marquee at our wedding. It was amazing. Neal and the team that came to set up were quick efficient, reassuring and great at coping with some stressed out people! Thank you. We honestly couldn’t recommend you enough.